Though no longer necessarily equipped with carbines, the origin of their name, carabiniers still command respect and fear in equal measure from enemies. Rather than firepower, they have a powerful charge they use to plough through enemies, breaking and scattering men with their straight heavy swords. 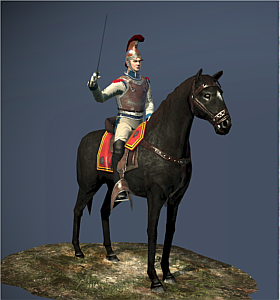 Their mounts are among the slowest horses used by cavalry, and are best employed in planned attacks rather than the role of reserve cavalry. Historically, French Carabiniers had royalist roots but, unlike the other royal units, managed to escape abolition during the French Revolution, and instead found a place in France’s newly reorganised cavalry. Despite this, the carabiniers still had some royalist sympathies and frequently clashed with the Revolutionary authorities. When Napoleon came into power he showered them with “armes d’honneur” in order to gain their loyalty. It worked. After the carabiniers sustained casualties in 1809 against the Austrians, Napoleon revised their uniforms, giving them cuirasses and helmets.